In 2003, Arts For Life expanded westward to Asheville and Mission Children’s Hospital. Asheville, also the home of Arts For Life’s headquarters, is well-known for its creative community of artists, musicians, and craftsmen. Our partnership with Mission Children’s Hospital is unique because Mission serves the entire 18-county region of Western North Carolina. If a child is diagnosed with cancer or another serious illness, they are sure to be cared for by the dedicated and compassionate team at Mission Children’s Hospital, including Arts For Life. and at the waiting room art table at the Olson Huff Center for Child Development. In 2001, Arts For Life got its start in Winston-Salem, at Wake Forest Baptist Medical Center’s Brenner Children’s Hospital. Eleven-year-old Katie was diagnosed and being treated for bone cancer at Brenner when her older sister, Anna, thought it would be a great idea to bring cameras and film to patients on the pediatric oncology unit and teach them photography. Katie became Arts For Life’s first art student, and Anna the first art teacher. Today, Arts For Life’s Program Director Betsey McLawhorn and her team of volunteer teachers, interns, and fellows continue to bring top-notch arts education to more than 4,000 patients and family members each year at Brenner. Thanks to support from the hospital, their Arts & Health Committee, and many doctors, nurses, healthcare providers, and others, we continue to serve more and more children in Winston-Salem each year. and at the Specialty Clinic art table on the 7th floor, including Cardiology and Nephrology. We also lead weekly art sessions at the local Ronald McDonald House of Winston-Salem, and partner with UNCSA ArtistCorps, a program of Americorps. Arts For Life began operating at Duke Children’s Hospital & Health Center in Durham in 2003. Duke Children’s Hospital is a very special place for Arts For Life to operate because they care for kids and families from so many different places: the Triangle area, throughout North Carolina, across the country, and even from around the world. We work with patients who speak many languages, but the languages of art and music are universal and ring loudly through Duke’s halls. Program Director Alison Griffin leads her team of teachers in providing art, music, and creative writing lessons to more than 2,000 kids and family members each year. and at bedsides on the Pediatric Inpatient Unit. In early 2015, Arts For Life launched a partnership with Carolinas HealthCare System’s Levine Children’s Hospital in Charlotte. In our first year, we reached over 1,000 patients and family members through the arts. 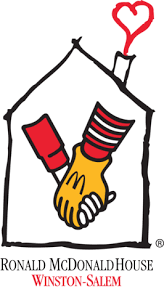 We also bring regular art sessions to kids and families at the Ronald McDonald House of Charlotte. the Pediatric Intensive Care Unit.